Notice: Getting ready for a new school year! Celebrate spring Bulgarian-style with a dance party, featuring live music on two stages by Mila Vocal Ensemble, Nomadi, Orkestar Bez Ime, and Traki, co-hosted by the Bulgarian School of Minnesota. New this year: Make your own martenitsi! Kid-friendly until 10pm. Tickets available directly through Amsterdam. 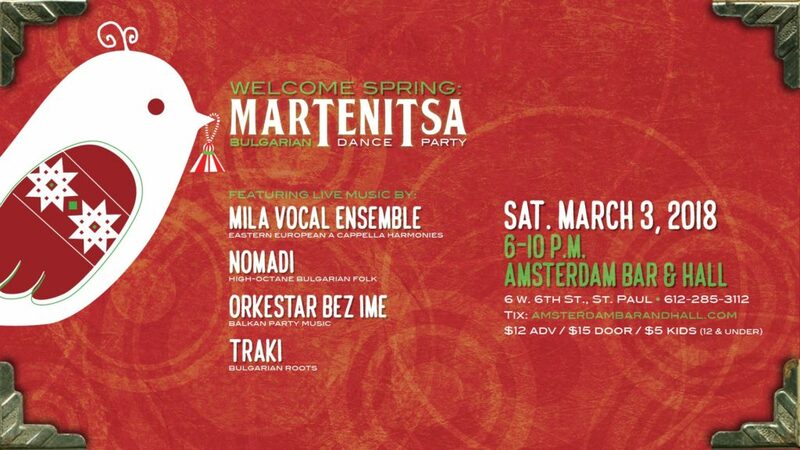 Orkestar Bez Ime (OBI), Mila Vocal Ensemble, Traki and Nomadi proudly present Martenitsa, an annual Balkan celebration of spring—now at the Amsterdam Bar & Hall in St. Paul. What started as a small underground gathering of Balkan music-obsessed fans and the local Bulgarian community has grown into a massive Balkan dance party! Each group will perform both individually and collaboratively to celebrate not only Martenitsa but also Bulgarian Independence Day. Martenitsa is a musical celebration of the coming of spring and the holiday of Baba Marta (baba meaning “grandma,” and Marta a derivative of the word for “March”) Traditional folklore depicts Baba Marta as a temperamental old woman whose moods are as changeable as March weather. On March 1st, it is customary to exchange and wear Martenitsi—tokens of good health, luck and vitality. Wearing the red and white yarns of the Martenitsa symbolizes the hope that Baba Marta will smile and grant us an early spring. As we Minnesotans know, the end of winter can never come soon enough. When: Saturday, March 3rd, 2018, 6 – 10 p.m.
Finds us on Google Maps!